I believe in the potency of all that is small. For this reason, I love Spring: small shoots of green, small bright buds of hyacinth, windflower, forsythia, small baby animals–and the small green promises of strawberries. And today, two small wrens (I think) who, unafraid, hopped along the split rail fence at my driveway for a better look at me as I opened the trash can, before they fluttered up into my neighbors apple tree studded with tiny white buds-about-to-open. The power of small is how I came to make this tiny tofu pie. For most of my life right up through my mid-fifities, tofu and I have been very good friends. It was just a few years ago during an especially challenging part of peri-menopause, that I started to get the feeling it may have turned on me, contributing to disconcerting and exhausting tendency toward night sweats. So even though I’ve never tested intolerant or allergic to any soy foods like tofu, edamame or miso, I decided to take a sabbatical from eating them to see if it would help ease my transition through menopause. When I started writing this blog I was in the midst of that sabbatical, and so all my recipes have been soy free. But now that there’s no more “peri” preceding my menopausal status, things are quite different. The MS has always made my ability to regulate my body temperature difficult, and with eating low fat whole plant foods that has seen dramatic improvement. But sometimes, for instance, after the fever I had with the flu, finding the right zone can be a challenge and my body will go through days of nearly constant–though, thank goodness, extremely mild–hot flashes, as it tries to reset the balance. A firm believer in letting my food be my medicine, I decided to perform one of my “science experiments” to see if, once again, tofu and I might be allies. Since I’d read from several sources that up to 3 servings of minimally processed soy foods can be beneficial for post-menopausal women, I wanted to see if I could find a portion size that would calm the flashing down. A single slice just under the 1/3 of an ounce that is designated as a serving on the package of the Wildwood Sprouted Tofu I bought (after lymph testing it in the store) did the trick like magic. So does 1/3 cup of shelled edamame beans. It’s easy to crumble up this much tofu and toss it into a stir fry, and sometimes I do that, without the worry that I’ve cooked a whole pound of tofu and now have to eat it all. But sometimes, as you know, I like a little dessert treat. I’ve written a lot of posts on this blog about satisfying that pleasure, without sugar, oil, or even flour. And this is one of those times I hit the minimalist jackpot again. Some of you may have your own compelling reasons not to eat soy, and so for you I provide a couple of soy free filling alternatives to this rustic little pie. It’s inspired by my late Aunt Ann Melchiorre’s ricotta pie, which she once made for Easter dinner. A traditional pie crust was filled with a custard made from ricotta, sugar, eggs. and citrus–studded with chocolate chips. It had a somewhat chunky rather than smooth texture–rustic–and absolutely divine–sort of like a peasant cheesecake. This version has no pastry, no sugar, no eggs and no chocolate. But the tofu and the carob and citrus peel do a wonderful job of replicating the texture of her filling. It can be made in the microwave or baked in the conventional oven. And it’s easy as, well, pie–but much much healthier. All measurements are approximations. Taste if you need to, and see if it needs “a little something”more. 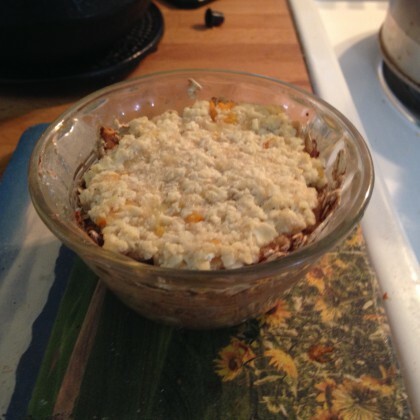 Put all the crust ingredients in a small baking dish and press and smoosh together with a fork until all the oats and the date pieces are moist and adhering together somewhat. Press it around the sides and bottom of the dish–it won’t be perfect–so long as you have a little cavity for the filling, it will be fine. Microwave for 1 minute. Or heat the oven to 350 and bake the crust for a few minutes while you make the filling. 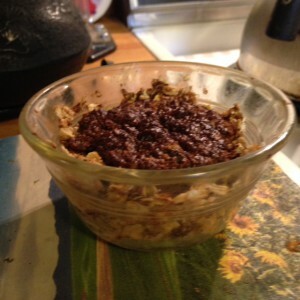 Combine everything but the banana in a small dish and smash with a spoon until the tofu is all crumbled and mostly combined with the carob. Place the slice of banana in the bottom of the pie crust. Spoon the filling in on top of it. Microwave for 1 minute and 30 seconds, or bake in 350 oven for half an hour. Let cool a bit before digging in. For the pineapple version: instead of the carob powder, add a tablespoon of crushed or pureed pineapple, fresh or canned, to the tofu and other ingredients. A little bit of ground ginger or cardamom is also a nice addition. And don’t forget the banana slice at the bottom. Soy free filling options: Make some chickpea tofu and use that. The filling is likely to be more custard like, but it should still be delicious with either the carob or the pineapple. Alternately, skip the tofu making and mash up some banana with vanilla extract, a splash of almond milk or lime juice and maybe some lime zest. Either fill your pie crust entirely with the banana mixture, or add a few frozen blueberries to it. Or instead of the berries, add some carob or cocoa powder for a chocolate banana custard effect. It’s not likely I’ll be posting recipes using a whole pound of tofu. A little bit goes a long way for me. If you’d like a little bit, too, then give one of these versions a try. You don’t have to be menopausal to make your life just a little bit sweeter– and without any sugar at all. I’m glad adding in a little soy is doing well for you! It’s nice to have less restrictions every now and then. This looks like a tasty, easy, and quick dessert – even giving me a couple ideas to try! Spring is my favorite season; much for the same reason. All the little blooms and chirping birds and early harvests… It makes my insides smile to just sit outside in the sun watching everything live. I watched a hummingbird raise her two babies outside my window, and I think there are a couple finches building a nest in a tree in the yard! The squirrels are making their usual adorable mischief. The jasmine is blooming and releasing its fragrant aroma. The honey bees are back and flitting in the lavender. The farmer’s market is getting busier with the early spring produce. Tofu and I are very good friends, and I’m on excellent terms with carob, too. I love the idea of this dessert — perfect for a solo afternoon treat! Maria – I can’t stand it. Will you please come and be my personal chef? Please? A question: what do you mean when you say you “lymph tested” the tofu in the store? Thanks Cheryl! And yes, definitely double the little tiny pleasure for your DH! 🙂 To answer your question about lymph testing: for years I went to an integrative manual therapy practitioner http://www.pt4kids.org/id10.html who taught me, and others, in a workshop, how to palpate the movement of lymph in our forearms. Once we could feel it, we then held various foods she had out to see if we could discern the direction of the lymph movement. If the lymph moves toward the heart, which I could definitely feel in my upper arm and then an expansion in my chest, it is considered a helpful food for whoever is testing it in that manner at that time. If it doesn’t move or moves away from the heart, then it is thought better to avoid that food. Hope that helps. I tried to find something specific on this technique on the internet but didn’t come up with anything but the general link to what Integrative Manual Therapy is, but it should give you an idea of why this would come from such a hands on therapeutic approach.